With the Common Core shifting our teaching to a more in-depth focus on fewer topics, it’s creating quite a challenge for many people. Not only is it a new way of thinking for teachers delivering instruction, but it is also a new way of learning for parents, too. Sure we all “learned” math in school, but most of us learned procedures and didn’t stop to understand the “why” to what we were doing. So it’s no surprise there is so much resistance from parents and teachers when being forced to learn math in a whole new way! Many districts have adopted Engage New York to help teachers meet the Common Core Standards and integrate the eight mathematical practices. If you’re interested to see how Engage New York aligns to the Standards, check out one of my past blogs called, How does your district purchased math book align? There’s a PDF of a table that compares many different math programs across grade levels and their alignment to the Common Core Standards. Eureka Math (the purchasable version of ENY) was the only curriculum that was aligned across all grade levels studied. Well, we have come across a solution (thanks to some teachers in Hanover Horton) to help make your life EASIER when it comes to using Engage New York! It’s a website that provides math homework help… No, not just “cutsie” little games to use as a fun teaching tool. 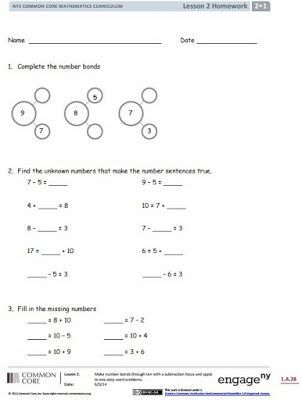 This Math Homework Help website provides additional practice for math that is learned in class for each grade level and module in ENY! This site is intended to help guide students/parents through assigned homework. You will see a sample of what was done in class and how it was completed correctly. This is an amazing resource for parents, teachers, students, principals, or anyone trying to learn or teach math in this new way!